Polishing went slightly too far just below the "R", you can hardly see it. The rest of the ball is fine. Includes insert. $200 or best offer plus shipping. For anyone that may buy this knob. 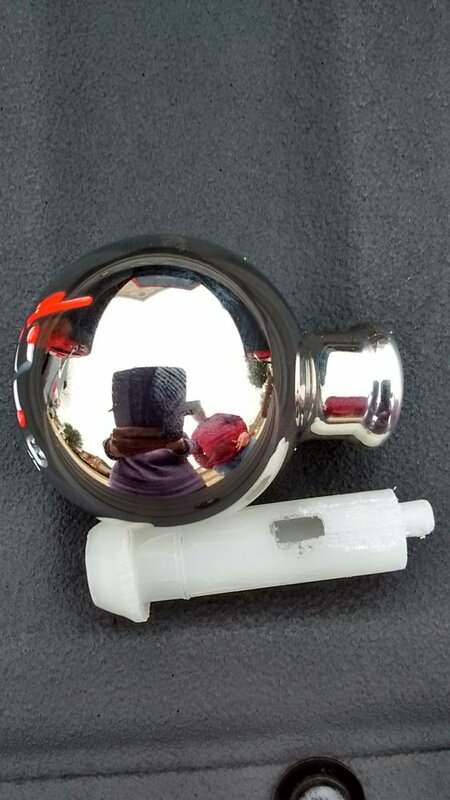 You just might find that during a hot day with the top down that that chrome knob gets pretty hot. I happen to have one of those custom leather knob covers that slips over the knob and stops the blistering scenario when shifting on such days. BlueStreak and Groceryman101 like this. 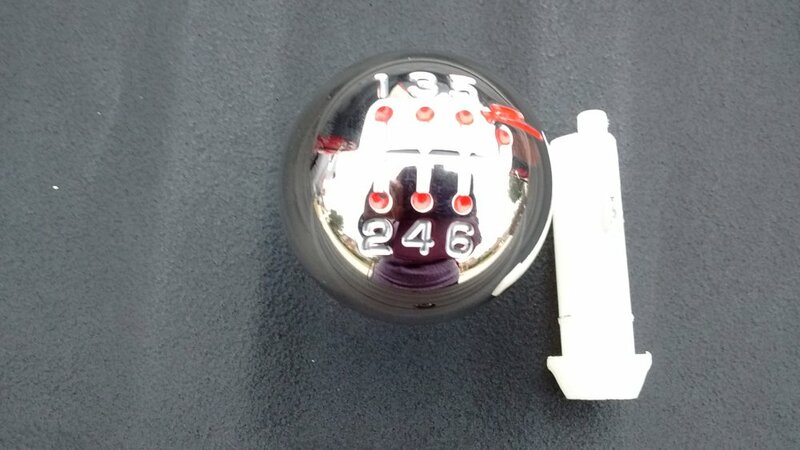 Someone named FLASH just posted yesterday the chrome 6 speed knobs are very hard to locate and if you can find one they go for about $450. Haven't verified that but they must be like gold. 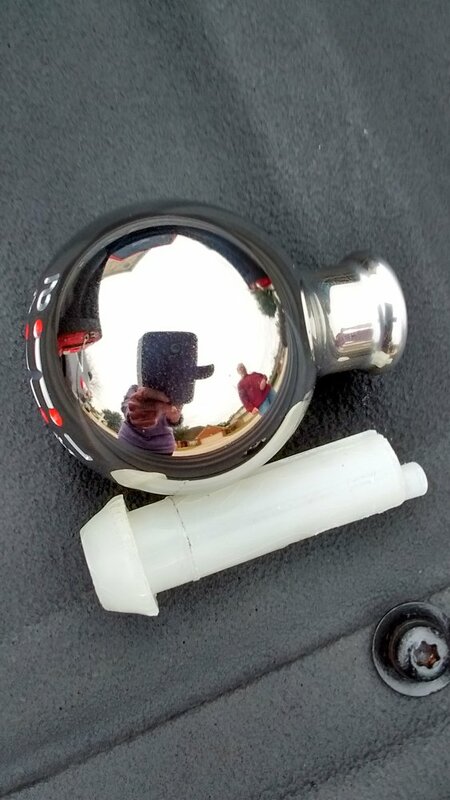 The chrome ball interests me, a lot, but I'm fearful the ball will create a need in me to replace all the rest of the satin trim in the cockpit. Based on the prices I've seen, that $150 ball could wind up costing me a couple thou, and, of course, it won't stop there. So moscooter, how much do you want for the leather cover? By the way, just because someone is bound to notice the description of the 04 SSR in my profile and want to inform me that the cover (and the ball for that matter) will not work for with automatic; I picked up a 05, Aqua Blur six speed a couple of weeks ago so the cover (and the ball) actually would work for me. I know I need to update the profile but I'm an old retired dude, I just don't move as quickly as my truck. Besides, I need to post my 04 for sale before I start making changes so please be patient with me. 05, 6 speed. Yellow with the bottom half Black. Daily ride of 3yrs. Just now working on her. I'll see you in Penticton in June, hopefully with the blur 6 speed. I'd be happy to help you spend your money. Let's see......... Hurst shifter, 410 gears, LS7 clutch, chrome trim,.........yup - I can help. By the way - you could just take your satin knob in to a chrome plater. At least it's metal, unlike all the rest of the trim. I've been shifting mine for 12 years so far, in a very sunny area, with the top down, and I can't remember ever noticing my knob was hot................the one in the truck. Auggie Doggie and PokerGuy like this.